This is a park near me with a small stream where I have shot some of my shallow water photos. 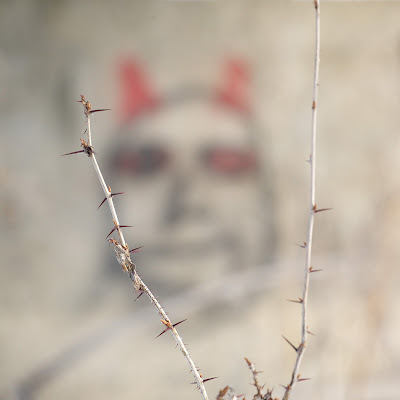 On a retaining wall, I found graffiti of satan with things like "Desten 4 Hell" and, my favorite, "Satin Returns". Have you noticed that Satanists often cannot spell Satan. "Satin" is a pleasant feeling, silk-like fabric; Satan-not so much. The curious thing about this is that since shooting these images, I have had on-going computer problems, mainly with this file folder. It took me 3 days to convert these images from RAW to JPG. When uploading this image to the blog, it stalled out twice and I had to do it from another computer. SOooo glad to see you in the blogosphere, Mike! And what a hoot this post is. Geez--something else to worry about. Satin. Who knew?